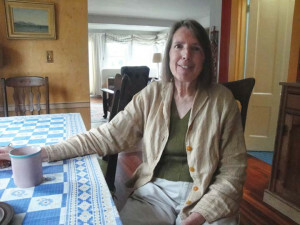 As one of the writers who has enrolled in Eleanor Morse’s Sudden Fiction classes on Peaks Island, I know that being a good writer and being a good human being are synonymous for Eleanor. It’s part of what draws us back to her mentoring over and over again. Eleanor says she has “come home to writing” and this award-winning author and Spalding University M.F.A. faculty member seems very comfortable there indeed. 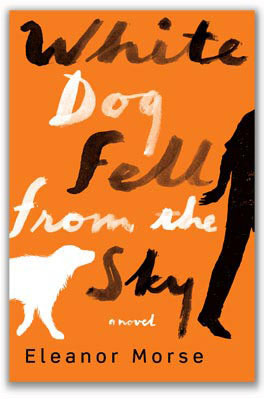 The publication of her third novel, White Dog Fell from the Sky, is garnering praise from readers and writers alike. I caught Eleanor in the midst of her busy schedule for long enough to interview her about her newest book that hits bookstores next week. Q. What was the inspiration for writing this novel? A. In 1970, I married a man who had grown up in Botswana. Two years after we were married, he and I moved to Gaborone, the capital of Botswana. The country had just gained independence from England in 1966; looking back on it, I understand how fortunate we were to be living and working there during those early years of independence. My husband became the Permanent Secretary of the Ministry of Agriculture, and I became the head of the national ofﬁce of the adult education wing of the tri-country University of Botswana Lesotho and Swaziland. It was a heady and hopeful time in Botswana. The discovery of diamond and of copper/nickel deposits shortly after independence put Botswana on a ﬁrm economic footing. An almost non-existent army siphoned off few resources, and money poured into new schools, hospitals, and social services. Seretse Khama, the ﬁrst president of Botswana, was a highly intelligent, enlightened, well-respected and well-educated man. Next door, apartheid still gripped South Africa. Botswana was a ﬁrmly multi-racial country, but its neighbor’s policies cast a long shadow. I wanted to portray some of that contrast in the book. In addition, I wanted to capture the harsh beauty of the land, the wild animals and herds of cattle thirsting for water during drought years, and the ways that government policies affected the indigenous San people. Q. Did you feel that you grew or changed as a writer while working on this particular project? A. The writing deepened my understanding of those years when I was a young woman in southern Africa. I was only twenty-six years old when I went to Botswana. White Dog Fell from the Sky is not my personal story, but the backdrop is the Botswana I knew during the mid-1970’s. In creating this book, I was mining memories of the language and landscape, of my journeys out into the bush, of my own white guilt in a black African country. Through research, I learned more about the terrible realities of apartheid, and I understood more fully how land use policies adversely affected the survival of traditional Bushmen families. I’m comfortable with, or want to see. Q. How did you decide upon the title? A. I wanted a title that would evoke a concrete image and draw a reader into the book. I had various ideas, but this one had the feeling I was looking for. The title comes from the early chapters of the book: Isaac is a political refugee who ﬂees South Africa. He’s nearly dead when he arrives in Botswana, and when he comes to, a dog is sitting by his side. She refuses to leave him, and later, he says to himself that she is like a creature who has fallen from the sky. White Dog is a persistent presence in the book. She asks for nothing and is single-minded in her patience and loyalty, against all odds. Q. How do you juggle living on an island with teaching in a distant MFA program? A. Life used to be much more of a juggling act than it is now–raising kids, working full time, shoehorning in a few hours a week to write. Now, teaching in an MFA program at Spalding University in Louisville, the work involves intense periods of teaching every six months at residencies in Kentucky followed by six-month semesters mentoring graduate students. During the semester, students send in ﬁfty pages of writing every three and a half to four weeks for critiquing; when those packets arrive, I need to drop everything to attend to them. Otherwise, I’m free to write. This summer, I’ll be teaching in Ireland through the same MFA program, and mentoring students over a longer nine-month semester. I am reading White Dog Fell from the Sky and could not help looking up who this author was that obviously was so intimate with and loved Botswana. What a lovely story it is and so beautifully written. As someone who volunteered in Botswana after I retired from the Univ of New Mexico Hospital clinical lab in 2007. I only spent a total of 6 months in Gabs but did get to know the Batswana, and through my consultation work, got to travel to 39 hospital labs in Bots. I truly miss those friendly folks very much. p.s. I am a Mainer even though I have now lived in New Mexico these past 20 years (moved from Great Island Harpswell to NM). Again my warmest thanks for your writing and this (to me) remembrance of Botswana. pps. My wife (not a Mainer) loves Peaks Island.